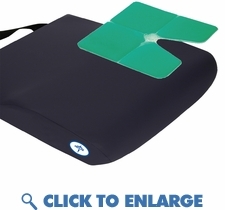 Anti-Thrust Gel Cushion: Designed to help eliminate sliding by aligning femur and ischials in proper position. Has one inch shelf in middle to reduce thrusting. Cushion has high stretch fluid proof cover that cleans easily.